Located in the central business District and opposite Wellington railway station - the interchange for long distance bus and rail travel, the Bluebridge Ferry Terminal, 8-minute walk to TSB Arena, a 12-minute walk to Westpac Stadium and within walking distance to city centre, Waterloo Hotel & Backpackers features a 24-hour guest kitchen, self-service laundry facilities and a games room with pool tables. Formerly the historic Hotel Waterloo, which hosted Queen Elizabeth II’s entourage on her 1953 Coronation Tour, the hostel features elegant staircases, high ceilings and a café in the old ballroom. Private and shared rooms are available. All rooms include heating and bed linen is provided. Each private room has a work desk and cable TV. Secure lockers are provided for all guests. Waterloo Hotel and Backpackers has 24-hour reception. 4 Star/Superior Hotel - The Rydges Hotel Wellington (Formally the Holiday Inn Wellington) is your home away from home when you are in Wellington. Located downtown on Featherston Street, with a spectacular harbour outlook, this elegant property is close to Lambton Quay, Westpac Stadium, Victoria University and short 10 minute walk to Wellington railway station - the interchange for long distance bus and rail travel and Bluebridge Ferry Terminal. 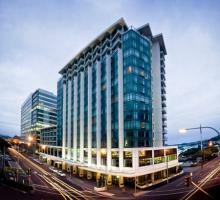 The Rydges Hotel Wellington offers 280 spacious guest rooms, all with kitchenettes and 19 suites with full kitchens. All these accommodation units are equipped with a range of modern amenities, to ensure you a truly pleasant stay. The Ibis Hotel Wellington is a 3 Star Hotel in the heart of Wellington's central business district, 20 minutes walk from Wellington railway station - the interchange for long distance bus and rail travel, Bluebridge Ferry Terminal, close to Custom House Quay and most major business and Government offices. The Ibis Hotel Wellington is Accor's major 3-star brand, renowned internationally for its consistent standards and genuine value-for-money rates. Aimed principally at business travellers, Ibis hotel Wellington caters for both domestic and international leisure markets. This 4-star boutique hotel offering ensuite classical hotel rooms with free Wi-Fi and is located in the heart of Wellington, 10 minutes away from the Westpac Stadium, Queen's Wharf Event Center, Railway Station and the Lambton Harbour. The restaurant serves a rich buffet breakfast daily and international dishes prepared with fresh local produce are served for lunch and dinner. 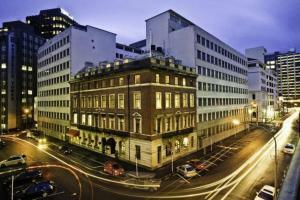 Wellington's parliament buildings are less than a 12-minute walk away. Guests are also situated within easy walking distance of shopping and restaurants. Located in historic Thorndon, close to Parliament, within 20 minute walking distance to Wellington railway station - the interchange for long distance bus and rail travel, Bluebridge Ferry Terminal, and city centre, shops, restaurants, harbour and Westpac Stadium, the Thorndon Hotel Wellington (formally Kingsgate Hotel Wellington) is a 3 Start hotel with 108 air conditioned ensuite rooms with TV/radio, DD phone, fridge, modem facility, mini bar, tea and coffee making facilities, 24 Hour Reception, room service, restaurant, bar, laundry/dry cleaning service, Conference facility, licenced restaurant and bar. Located in the central business District, is opposite Wellington railway station - the interchange for long distance bus and rail travel, the Bluebridge Ferry Terminal, 8-minute walk to TSB Arena, a 12-minute walk to Westpac Stadium and within walking distance to city centre, Waterloo Hotel & Backpackers features a 24-hour guest kitchen, self-service laundry facilities and a games room with pool tables. Formerly the historic Hotel Waterloo, which hosted Queen Elizabeth II’s entourage on her 1953 Coronation Tour, the hostel features elegant staircases, high ceilings and a café in the old ballroom. Private and shared rooms are available. All rooms include heating and bed linen is provided. Each private room has a work desk and cable TV. Secure lockers are provided for all guests. Waterloo Hotel and Backpackers has 24-hour reception.